This agreement is an important document. Please read all of it. For a printable version Click Here. Click here to read the agreement! If you do not agree with the rental agreement you must cease pursuing a stroller rental with Baby Wheels Orlando immediately. All Disney owned resorts will be delivered between the hours of 6:00 AM and 6:00 PM, they are due for pick up before 12:00 PM on the end date. If you are staying at a non Disney owned resort then your stroller will aim to be delivered by 9:00 AM on your start date and are due back to bell services/luggage rooms by 12:00 PM on your end date. 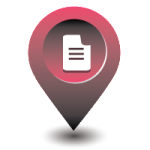 The customer agrees to return the stroller and accessories to the original delivery location unless other arrangements have been made. To make arrangements you must talk with a person on the phone or receive confirmation through e‐mail. Late equipment returns will be charged additional rental day charges + $35.00 Late Fee. 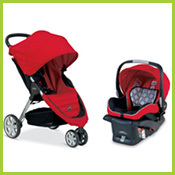 All Baby Wheels Orlando strollers and accessories are used at the renter’s risk of loss or injury of any type. The customer is responsible for any and all rented equipment from Baby Wheels Orlando during their rental period. You agree to hold harmless and indemnify Baby Wheels Orlando and all people associated with the company including non‐Baby Wheels staff involved with delivery or pick up of the stroller, such as hotel employees, from any and all claims and or injuries up to and including death. The customer is responsible for familiarizing themselves with the proper operation of the stroller before using. 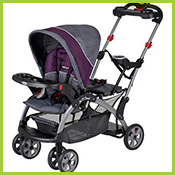 Baby Wheels Orlando will provide on each stroller an operational reference guide. Baby Wheels Orlando reserves the right to substitute equipment. In the event equipment becomes unavailable you will be notified as soon as possible. If we are unable to deliver a stroller due to premises access issues we will contact you for an alternate destination. If alternate arrangements cannot be made we reserve the right to cancel the booking and refund your money. You agree to abide by any and all state and local laws enforced upon rental equipment. You agree to use and/or collapse strollers in proper areas. 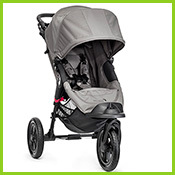 The customer is responsible for any theft, loss, or damage to the stroller and/or accessories. 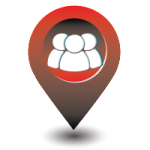 In this event the renter hereby authorizes Baby Wheels Orlando to charge the customer for any costs to replace and/or repair lost or damaged rental strollers, parts or accessories. 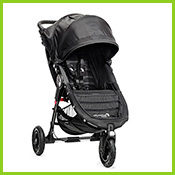 In the event of total damage or loss the customer may be charged for a new stroller. 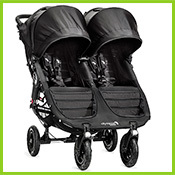 Strollers and accessories must be returned in the same condition originally received. Failure to do so will result in a $35.00 fee for extra cleaning. Optional Rental Insurance is recommended and covers in full the replacement or repair cost of the stroller and accessories, in the event they are stolen or damaged. If rental insurance is not purchased we reserve the right to charge a security deposit for the rental period. Security deposits are $250.00 for single strollers and $300.00 for double strollers. In the event there is any such damage or loss of stroller, customer forfeits any right to refund of the security deposit. Upon discovering any damage/lost or missing items you must call us immediately on 1‐800‐510‐2480, failure to do so promptly may result in insurance being voided. 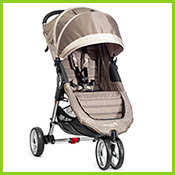 The customer is responsible upon receipt of stroller to inspect the equipment for proper functionality before use. If at any time during the rental period equipment does not function properly cease using immediately and contact Baby Wheels Orlando to make arrangements for equipment pick‐up and replacement. Customer will then have the option to continue the rental period with a replacement stroller and or accessories or receive a pro‐rated refund for the unused portion of the rental period. Any orders canceled within 48 hours of the rental start date will forfeit any refund. Any rentals made and cancelled within 24 hours of the start date cannot be refunded. 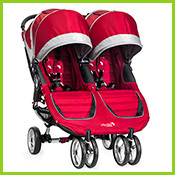 Rental Strollers and Accessories are to be used exclusively by the customer only. 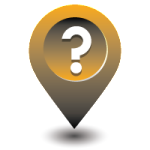 Your delivery/pick up site information may be disclosed with the destinations’ employees and staff. This allows proper drop off and pick up of rental strollers at the location of your choice selected upon reservation. 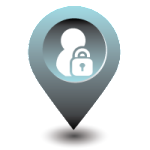 HANDLING, TRANSPORTATION, AND/OR RETURN OF THE RENTED EQUIPMENT AND/OR CUSTOMER’S BREACH OF ANY TERMS AND CONDITIONS OF THIS AGREEMENT. By accepting this rental agreement you agree to and acknowledge you have selected a stroller that is acceptable for your needs. 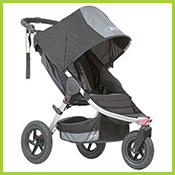 You understand Baby Wheels Orlando is not the manufacturer or designer of the rental strollers or accessories. Baby Wheels Orlando is not responsible to use the manufacturer warranty for itself or its customers. You understand the rental equipment is rented as is. You understand that all references in this agreement to Baby Wheels Orlando refer to the legal entity of Hopgood Enterprises LLC doing business as Baby Wheels Orlando.